Weird, that’s the answer. That’s usually my reaction to things coming out of Japan, but it goes really far here. In fact, as far as I can ascertain, the person playing chess, immediately visible on the page, isn’t even in this scene! 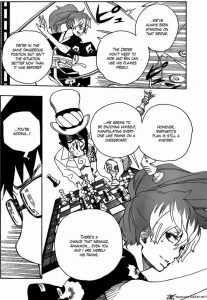 The whole image of him at the chess board is the artist taking the character’s metaphor describing their nemesis2 as chess master of manipulation literally and drawing him hanging in the void over some girl’s head, with a distinctly evil grin on his face. except that there’s also a white knight freely exploring the bounds of the page – it’s currently playing aureola to the aforementioned girl – a queen is precariously balancing on the border of the seahorse valley between two text balloons, and our friend the fiend has an additional pawn in his hand. Of course, we have no idea how the black pieces are arranged, but the white pieces aren’t horribly placed. The king’s wing looks very normal. The fianchettoed queen’s bishop and the long castling are, considered individually, not uncommon, but look rather strange together. 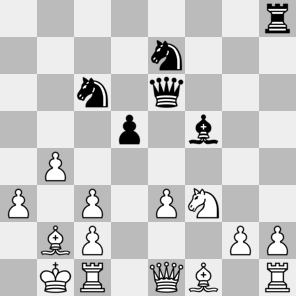 Also white’s pawn structure looks weird. But, hey, the few black pieces I can place are where they should be! Realism: 3/5 One thing is sure, the position on the board is far, far more plausible than the position of the board. Probable winner: That’s hard to say, since half of the board is obscured, but judging from his grin, Mephisto is doing well.